It's Thursday once again and this week's theme at Litratong Pinoy is Beloved Mother. 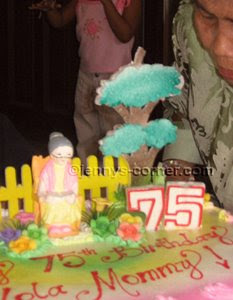 This is my mom while blowing her candle when she celebrated her 75th b-day last Oct. 2007. We are very happy and we thank the Lord bec. she is still strong and energetic for her age. Eventhough we are not complete that day (2 of my sis in overseas) we had fun, emotional and it was memorable for her.